Microsoft Corp unveiled faster, more powerful versions of its Surface tablet computer on Monday in an effort to boost poor sales of its flagship hardware product and mount a stronger challenge to Apple Inc's iPad. The Surface is key to Microsoft's plan to reinvent itself as a devices and services company, but the revamp comes less than a year after it brought out its own computers for the first time and failed to put a dent in the market. It has racked up only $853 million in sales while generating a $900 million charge for unsold inventory. At an event in New York, Microsoft unveiled two new machines and a range of accessories promising faster processing, better battery life and more apps. The new Surface 2, which runs on a low-power chip designed by ARM Holdings Plc, starts at $449 for the 32 GB version, not including a snap-on keyboard starting at $120. 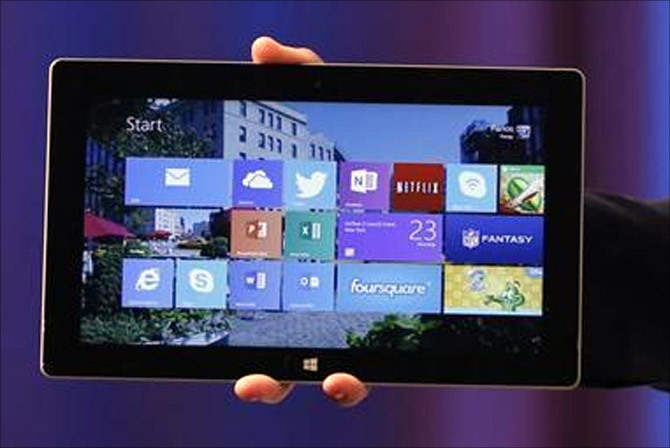 Image: Microsoft's Surface 2 is seen during the launch of their Surface 2 tablets in New York. That is slightly less than Apple's latest wifi-only 32GB iPad, which costs $599. 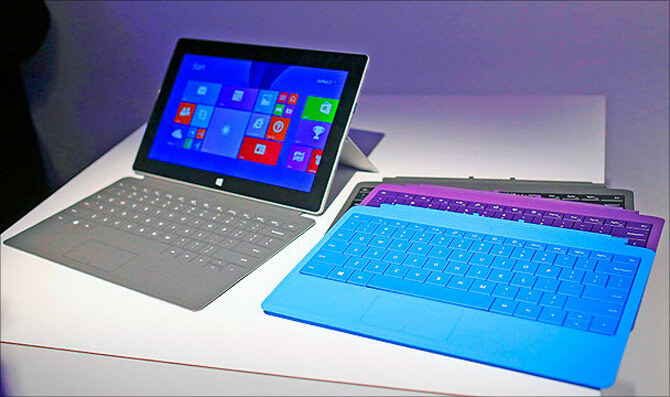 The new Surface Pro 2, which runs on an Intel Corp chip and is aimed more at the lightweight laptop market, starts at $899 for the 64 GB version, not including keyboard. Apple's cheapest 128 GB MacBook Air costs $999. "I don't see much incentive for people to buy these devices. Yes, they are cheaper than the iPads, but is that enough reason?" said Jack Gold, a technology analyst at J. Gold Associates. "It seems like Microsoft is just maintaining the traditional PC mantra - keep upgrading the chip and hardware a little bit every year at a slightly lower price. I think they needed to do something that was innovative beyond the first generation, and I don't see that in these devices." 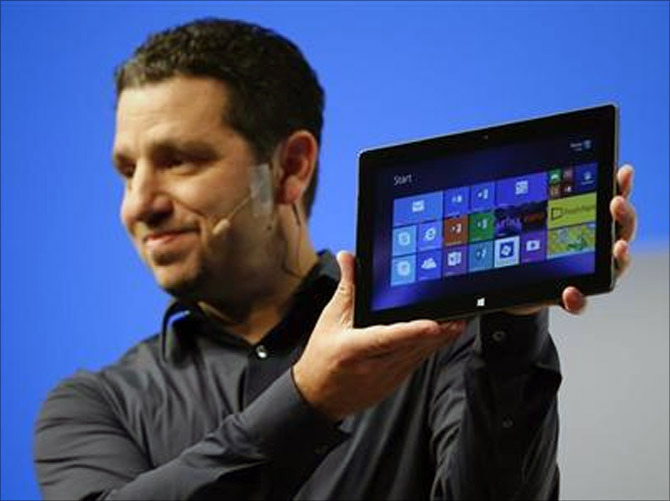 Image: Panos Panay, Microsoft Surface general manager, holds up the Microsoft Surface Pro 2 during the launch of their Surface 2 tablets in New York. Microsoft shares were steady at $32.82 on Nasdaq, while Apple shares rose 4 percent after reporting strong sales of its new iPhone 5s and 5c models and offering a more optimistic financial forecast. As an added incentive, Microsoft is taking advantage of its other products, offering customers free Skype calling to landlines in more than 60 countries for one year and 200 GB of free storage for two years on SkyDrive, its online 'cloud' storage product that competes with Google Drive and Dropbox. The Surface 2 comes preloaded with a stripped-down version of Office, including Outlook email. Surface Pro 2 can run the full, standard version of Office, but the software must be bought separately. The hugely popular Office suite is the Surface's one unique selling point over Apple, as Microsoft has not released full, custom-designed Office apps for the iPad. "What should be the 'killer app' is Microsoft Office," said Avi Greengart, an analyst at Current Analysis, who was more optimistic about the new Surface products. 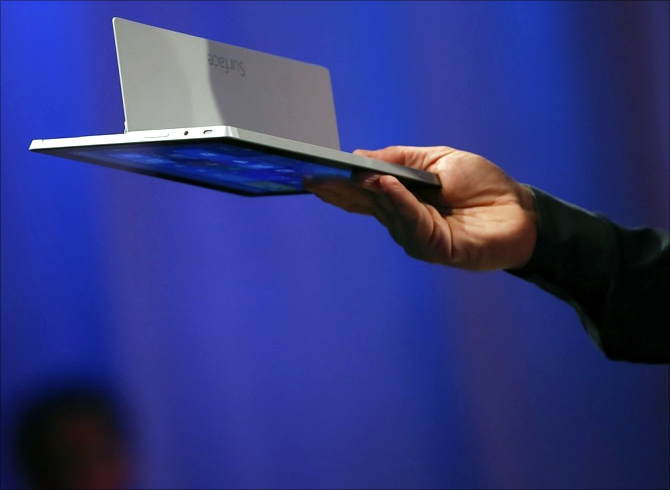 "The Surface Pro has a place as an ultra-portable notebook replacement. If you value the touch screen form factor at that price point, it's a reasonable option." Microsoft also introduced a range of thinner, backlit keyboards which double as covers, plus a new Power Cover which adds life to the battery, which will be available early next year. It also unveiled a docking station for the Intel-based Surfaces, so they can be hooked up to a desktop monitor, also available next year. 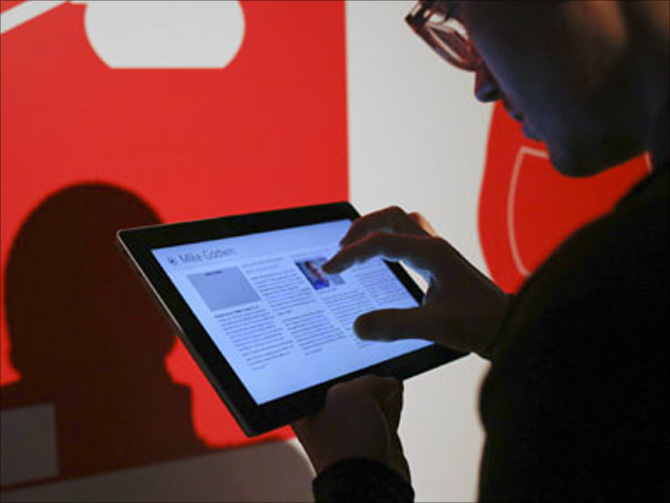 Image: A member of the media use the Surface 2. "This is about Microsoft making sure people understand Microsoft is here and will be part of the future of computing," said Carolina Milanesi, an analyst at Gartner. "But I think the competition is still very tough." The new machines will be available for sale online, in Microsoft stores and at a few third-party retailers in the United States and most other major markets, except Japan, on October 22. It will be available in China in early November. Will Sony succeed with the Xperia Z tablet?